I have received a lot of emails requesting the blanket that I am showing you here to be demonstrated… I guess it’s like judging the book by the cover… the picture doesn’t match but I haven’t been clear enough about this issue. What you see here is a 7 Colour Blanket. Black, Red, Orange, Yellow, Green, Blue, & Purple. In the tutorial showing you the NEVER ENDING GRANNY SQUARE. You learn how to do this. But for simplicity, I only showed you the 3 colours. BUT THATS because I have demonstrated an ongoing trend showing you what to look for and how to build up to more colours. So Going through that tutorial, you will learn how to do THREE, but you can use the same principles to go beyond it. 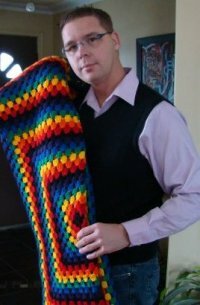 Many people have requested I demonstrate this blanket using the 7 colours, but because they don’t see the rainbow blanket in that tutorial, they think it’s different. It’s actually the same… just with more colours added. I am unable to demonstrate any patterns and could be a month or longer before I am capable. My computer has died and I don’t want to eat Diva Dan’s Disk Space while a new machine is being constructed for me. This entry was posted in Announcements and tagged Colour Blanket, Diva Dan Disk Space, So Going, THREE. Bookmark the permalink.